As an ex Londoner, it took me a while to appreciate the seasonality of fruit and vegetables in Croatia (and most other places for that matter). Now I realise just how much I took for granted in my past life – effectively the ability to pick up any recipe, no matter how exotic, and be confident that you could find all the ingredients somewhere in a London supermarket. Apart from all those air miles, there is a certain pleasure in planning the menu according to what’s locally available, rather than the latest fashion trends set by the celebrity cooks. Following the seasons and anticipating the timing, abundance and taste of the next crop, adds a little spice to everday living. The Croatian supermarkets, with some notable exceptions, are not great for fruit and vegetables, though there is a growing tendency to import for “the rich foreigners”. However, I have a strong suspicion that Croatia gets the EU rejects – no problem if it’s just that the shapes are less than perfect but very irritating when its flavourless Italian tomatoes! The markets are a lot better, Trogir and Split being lively and bountiful trading places in our neck of the woods. Better still is the lovely beaming grandmother who sits on the wall outside our house for a couple of hours with whatever she happens to have dug up from her garden that morning. It’s difficult to imagine such a frail lady spending so long cultivating so many good things and trundling her wheelbarrow a couple of miles every day, to gain poll position opposite the supermarket. However she’s consistently there with the freshest of produce, at knock down prices, and always in the best of humour. No matter that her ten words of Croatian, receive only a few stuttering syllables back but my Croatian numbers have improved rapidly as counting is not her strongest subject and she frequently asks me to work out my own bill! We are lucky to live on the ground floor of a large house with what might be described as a small holding and an extra piece of land “somewhere else”. I’m challenged to think of any vegetable or fruit which doesn’t spring to life sometime during the year around us and September/October is a particularly rich time of year, with our landlords at their busiest. The white grapes came in two weeks ago, though we had to decline some of the basinful we were offered on the grounds of potential waste (and we’d rather have an extra bottle of home made wine! ), the pomegranates are pretty well ready, the red grapes came in today (no question of refusing the basinful this time) and the kiwis look ready to drop from the leafy bush that has provided our welcome shade throughout the summer. In a couple of weeks it will be time for the olives. By all accounts 2006 is going to be a great year for Croatian wine. There was a lot of rain a few weeks ago but plenty of sun recently and that is, apparently, ideal for grapes – sweet and juicy and plenty of them. Let’s hope the forecast rains don’t have an adverse effect on the olives as Croatian Olive Oil is pretty special too. Today’s photo shows the freshest of seasonal produce, straight from the vine, just fallen off the tree, or ready to drop. 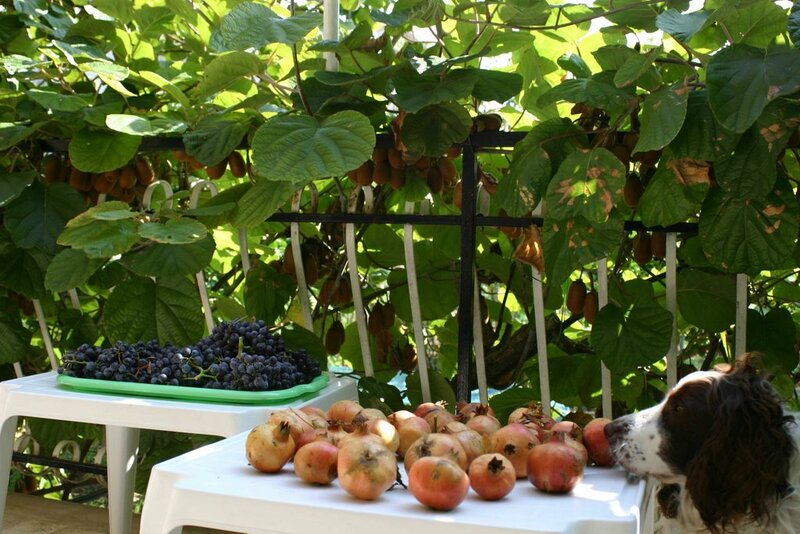 Rosie the dog has never been camera shy but is finding the pomegranates hard to resist – they make great substitute balls! How lucky you are! Pomegranates are more than a pound a piece in our local Sainsbury's. Figs are an alltogether different story. 69p for a tiny underripe fig with no flavour. Yes, here in UK you can buy any fruit and veg any time, but at very high prices and no flavour. Yes, we do feel lucky in that respect and thanks for your comment. 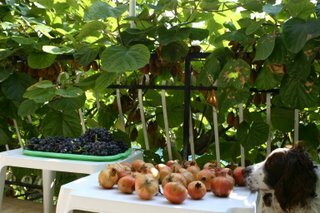 There is a downside however - having waxed lyrical about the joys of seasonality I then had to knuckle down to finding some "grape recipes" and spent most of yesterday evening washing, de stemming and de pipping hundreds of grapes! Now our small freezer is full of grape confit, frozen grapes and a number of other delights. I wouldn't swap it but late last night I saw a certain advantage in being able to buy what you want, when you want, and paying someone else for the labour element!